In the NewsPrint. Video. Radio. 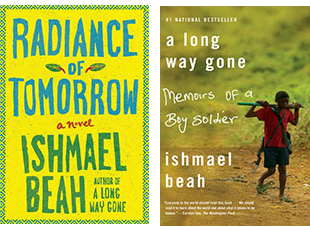 Ishmael Beah, born in Sierra Leone, West Africa, is the New York Times bestselling author of A Long Way Gone, Memoirs of a Boy Soldier and Radiance of Tomorrow, A Novel both published by Farrar Straus & Giroux. His Memoir has been published in over 40 languages and was nominated for a Quill Award in the Best Debut Author category for 2007. Time Magazine named the book as one of the Top 10 Nonfiction books of 2007, ranking at number 3. His novel written with the gentle lyricism of a dream and the moral clarity of a fable is a powerful book about preserving what means the most to us, even in uncertain times. Already available in several foreign languages, the New York Times finds in his writing an "allegorical richness" and a "remarkable humanity to his [Beah’s] characters". A UNICEF Ambassador and advocate for Children Affected by War, Ishmael Beah is, among other titles, a member of the Human Rights Watch Children’s Advisory Committee. He is based in Los Angeles, California, with his wife and children.